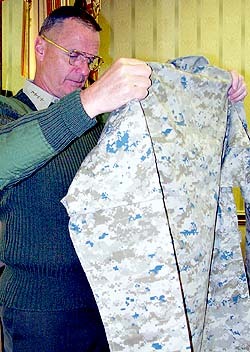 Marine Corps Commandant Gen. James Jones checks out the uniforms for his Marines. The Corps hopes to begin issuing the new uniforms this summer. WASHINGTON  Now you see them, now you dont. Thats the mantra behind the U.S. Marine Corps quest for the new digitally dappled camouflage uniforms being field-tested by Marines in Okinawa, Japan, and two bases in California. Marine Corps Commandant Gen. James Jones wanted his Marines to stand out in the new "cammies" when compared with other services, yet blend into their surroundings during combat. The techno guise of the material gives the uniform a three-dimensional look and quickly blends into surroundings, Corps spokesman Capt. Pete Mitchell said. "Its almost like its a play on light," he said, describing the way the pixilated material changes with movement. The Corps has gone high-tech to invent a better camouflage, Mitchell said. "But our second purpose is that the Marine Corps seeks to stand out in appearance." For two decades, all four of the military services have donned similar-looking uniforms, with minor exceptions that allowed the Marines to stand out, Mitchell said. In fact, the Marines desire to stand out dates even further back. During the Korean War, for example, Marines continued to wear their yellow protective gaiters over their boots after the U.S. Army stopped using them. Marines stood out, Mitchell said, and enemy soldiers called them the "yellow legs." During Operation Restore Hope in Somalia in 1992 and 1993, Marines wore different-colored boots, and during Operation Restore Democracy in Haiti in 1994 and 1995, they rolled their shirtsleeves in the opposite direction of other forces. "We want to be instantly recognized as a force to be reckoned with," Mitchell said. "We want them to see us coming a mile away in our new uniforms." But when the critical time comes, Marines want to be invisible in their new uniforms. For some, the news gets even better. The new uniforms might be less expensive than the $45 to $50 it now costs for a set, spokesman Staff Sgt. Keith Milks said. By mid- to late summer, the Corps hopes to issue the new uniform to recruits and Marines entering Officer Candidate School. The rest of the Marine fleet will soon follow, but within a transition timeline that is "fair and reasonable and wont put any undo burden on an individual Marine," Milks said. Active-duty Marines will be required to buy the uniforms. Enlisted personnel get a clothing allowance. Officers do not. Marines sought a "bottoms-up" approach to designing the uniforms and set up an online, 35-question survey seeking input from anyone who cared to voice an opinion. About 36,000 people responded to the Internet questionnaire, Milks said. The questionnaire was divided into three sections  one seeking input on trousers, one on the shirt and the third on accessory items like covers (hats), belts and boots. Roughly 25,000 of the respondents filled out all three sections, Milks said. Propper International of Puerto Rico and American Power Source of Massachusetts have designed the prototype. The final vendor has not been chosen and the ultimate cost of the contract has not been set, Mitchell said. The companies have developed the tan, "desert" version that would be used during combat in arid regions, and a "woodland" version for combat in jungles and other areas. Marines in Okinawa, Japan, and Camp Pendleton, Calif., are trying the woodland uniforms, while those stationed in Twenty-Nine Palms, Calif., have the desert ones. "Were also trying various items on uniforms, like Velcro in place of buttons and slant pockets instead of vertical ones," Mitchell said.